Since Halloween is this Friday, I’ll start by talking about All Hallow’s Read, a five year old tradition started by English author Neil Gaiman. The event’s message is simple: this Halloween, give someone a scary book to read. “We’re not saying don’t give candy,” says Gaiman, “Candy is important. Fake blood is important.” And while it’s clear that Gaiman ain’t no Halloween expert (he’s not sure if Zombie teeth are important), the same can’t be said about writing books. He knows a lot about writing books. Scary books. Fantasy books. His latest book, available online now (in standard and oversized deluxe editions), is a rewrite of the Grimm Brothers’ Hansel & Gretel. But it’s much more than that. It’s a piece of art, too, featuring the most wonderful black and white drawings by Lorenzo Mattotti, in two-page spreads. Of the book, Gaiman says “it’s a story with modern relevance…which reminds us of how paper thin civilization really is. It’s about hunger, and about families.” The book, even before its release, is set to become a feature film, with The Hundred Foot Journey’s producer Juliet Blake having bought the feature rights. 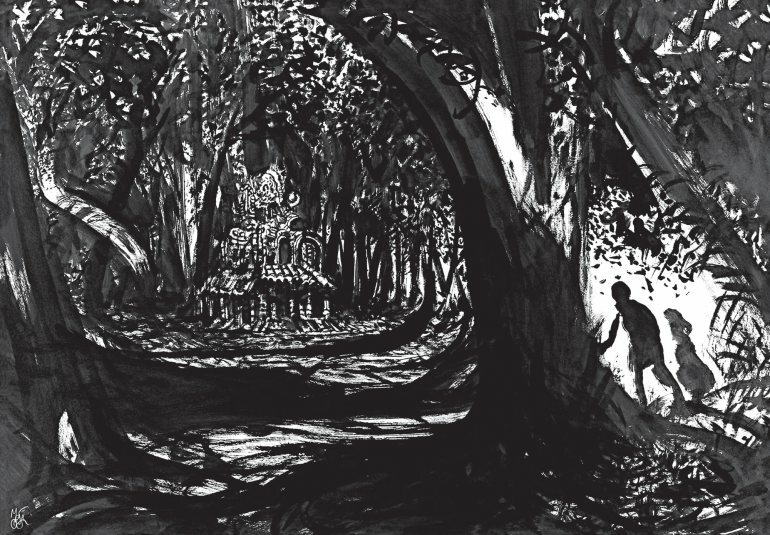 Mattotti’s Illustrations are outstanding; black and white and spooky. Famous for novels Coraline, Stardust, Neverwhere, American Gods and the DC comic book series The Sandman, Gaiman’s recent books include The Ocean at the End of the Lane (though not strictly YA, it is, according to Gaiman, “for anyone who has ever been seven years old”), Fortunately the Milk (for children) and The Sleeper and the Spindle (coming soon, and featuring a controversial kiss between two women). Coraline and Stardust have also been adapted into feature films. Gaiman has also penned two Dr Who episodes. Fans of the author have much to look forward to in the next year or so, too, with The Sandman coming to the big screen and American Gods to TV. Gaiman is also a prolific social media man. With seventy five thousand followers on Facebook and over double that on Twitter, he readily shares his life with the world and this lends him an ordinary man persona which everyone seems to love. He’s no haughty author, this one. Married to famous American singer/songwriter Amanda Palmer (who is set to perform in Hobart’s MOFO music festival in early 2015), she and Gaiman do lots of cool stuff together, like recording songs, challenging each other to the ice bucket thing (okay, so that’s somewhat passé by now) and generally loving each other silly. 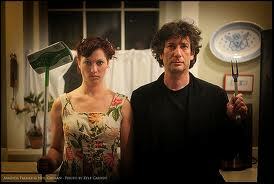 Gaiman and Palmer working on her photo book ‘Who Killed Amanda Palmer’. He’s also a humanitarian of high order. Just this year he visited refugees in Jordan “to bring the voices of the people in the camps to the wider world,” after UNHCR (the UN Refugee Agency) noticed that more people became engaged with the issue when he re-tweeted their tweets. And last month, Gaiman was part of a reading charity auction, where his novel Neverwhere was immortalised as a BookBench sculpture for auction. The bench raised two hundred and fifty thousand pounds. And there’s more: last year the Gaiman Foundation helped fund the creation of a Bus that houses mobile showers for the homeless, “Lava Mae”. 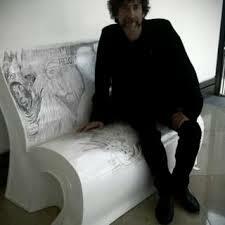 Gaiman on the Neverwhere bench. Add environmentalist to the list, too. He’s a patron of Bookend Trust, “an education initiative that seeks to inspire students and their communities with the positive environmental careers they can build making the world a better place.” He’s written a film for them called Sixteen Legs. Donate to the cause and you can even win yourself a trip to Tasmania with the man himself. I can keep going, by telling you about his inspiring commencement speech at the University of the Arts in Philadelphia where he delivered the inspiring Make Good Art speech. Or that he’s had a cameo on The Simpsons. He’s that famous. You’d think with such an array of do-gooder strings to his bow that people might find him a bit hard to take. But this is not so, as his persona seems built on equal footings of wild talent and humility. Such are Gaiman’s abilities, one gets the impression he has more in common with the fantastical creatures of his books than us mere mortals. Perhaps this is the key to his genius. Whatever the answer, Neil Gaiman is being true to his word. He is indeed making good art.